Maryland tour guide: Enjoy your visit, Big Ten fans! Planning a road trip to Maryland to see your Big Ten team take on the Terrapins? Well, you’re in luck, because I asked Jeff Ermann (@insidemdsports), of Inside MD Sports, to compile a tour guide for visiting Big Ten fans. Check out his guide in this post. 1. Comcast Center: Known as the house that Gary [Williams] built, Comcast Center is one of college basketball’s premier basketball arenas and often a nightmare for opposing teams. Opened in 2002, the arena’s trademark feature is ‘The Wall” — a steeply-built, intimidating 2,600-seat student section behind the visiting team’s second-half basket. Capacity seating (17,950) at Comcast, whose playing floor was dedicated to Williams in 2012, is second only to Ohio State in the Big Ten. 2. 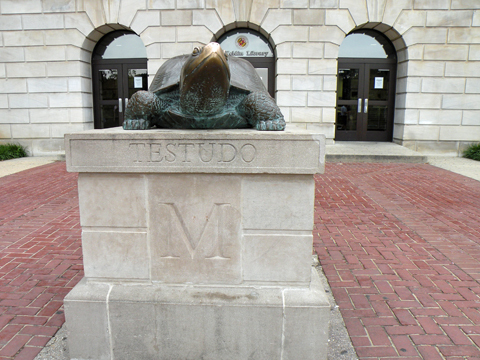 Testudo: Testudo, Maryland’s mascot, is a diamondback turtle native to the nearby Chesapeake Bay. Adopted as the school’s official mascot in 1932 — Maryland teams were previously known as the ‘Old Liners’ — he can be found in statue form in three different campus locations: Comcast Center, Cole Student Activities Building and at Byrd Stadium. Students traditionally leave Testudo offerings of all sorts, including food and beer, in exchange for good luck during finals week. One of the statues is located outside the Terrapins’ locker room at Byrd Stadium, where Maryland’s players touch it for good luck as they run onto the field before games. 3. The Comeback: While Maryland is known as a basketball school, it’s also had its share of football success, highlighted by a national championship in 1953. 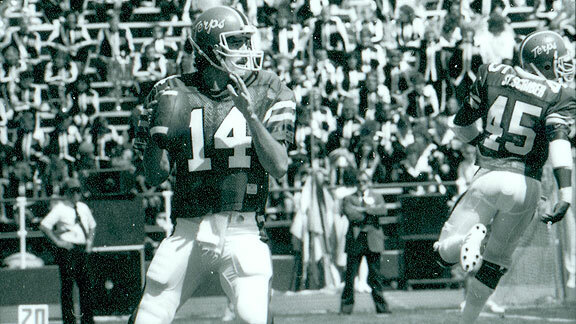 But the most memorable game in the program’s history took place in 1984, when quarterback Frank Reich led the Terps back from a 31-0 halftime deficit to defeat Miami, 42-40. It was the biggest comeback in NCAA football history, but would later be eclipsed when Michigan State erased a 35-point deficit against Northwestern in 2006. Reich, meantime, went on to break the same record in the NFL in 1993, leading the Buffalo Bills past the Houston Oilers after trailing by 32 points. 4. Route One: If you’re looking for pre-game eats, shopping or want to stroll around during your visit, Route One is the place to do it. Also known as Baltimore Avenue, it’s a hub of activity for students and local residents alike. The busy strip is lined with shops and restaurants, including R.J. Bentley’s — College Park’s traditional gameday spot for food and adult beverages. Bentley’s, which sits on the corner of Baltimore and Hartwick Ave., has gained notoriety in recent years thanks to a signature catch phrase — “Let’s go to Bentley’s!” — diehard Maryland alum Scott Van Pelt uses after recapping Terps wins on SportsCenter. 5. In the Shadow of Nation’s Capital: Few college campuses boast the sort of major metropolitan proximity College Park has to Washington, D.C. Driving times can vary wildly due to heavy local traffic, but a 35-minute ride on the Metro Rail will land you near Washington landmarks like the White House, the Washington Monument and the Smithsonian, which is the world’s largest museum and research complex. While the nightlife in College Park is limited compared to many universities of similar size, there’s an endless supply of activities, sightseeing and hot spots in the District.